From Toorongo to the Ada Tree, the Federation Track follows fire trails and forestry roads through dense mountain forest with occasional views across the ranges and valleys. The Ada Tree is astonishing! It dwarfs the Myrtle Beeches and is more a nineteen storey arboreal skyscraper than a tree. From the Ada Tree the track follows old tramlines past old mill sites, across log bridges and down the High Lead where a haulage line dragged logs up to the tramline. 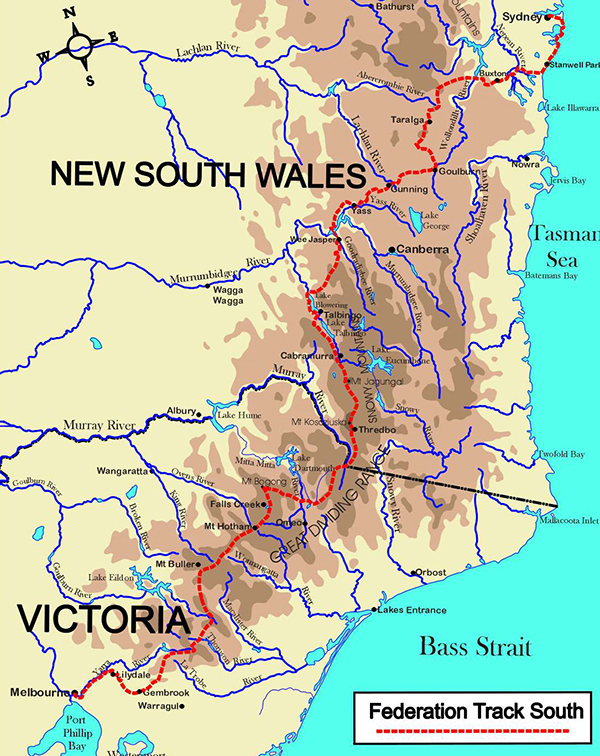 The track next runs beside the Latrobe River before climbing gradually to Seven Acre Rock. The view from this gigantic granite outcrop is stunning. From the olive green of Bunyip State Park to the lush, green dairy country of western Gippsland and the dark brown checkerboard of the potato fields around Kooweerup. On the horizon Westernport Bay and Bass Strait gleam in all their splendour – the first sight of the ocean for 1,200 kilometres. The Federation Track then follows the route of the old Bowman Track to Gembrook past excellent views across Bunyip State Park and through the rich chocolate soils and lush green crops of the Shepherd Creek Valley. The route follows (or rides) on the Puffing Billy Railway to Cockatoo through rolling farming country while at Cockatoo the Black Friday memorial is a reminder that this green, forested country can erupt into wildfire. You then follow local tracks to Emerald Lake Park which is a blaze of red and orange in autumn before wandering through Emerald to follow local tracks along treefern-lined creeks to the Dandenong Range. The Federation Track crosses this ridge at Sassafras to run along the western flanks of the Dandenong Range through tall gum forests with occasional glimpses of Melbourne’s suburbs before detouring to Mt Dandenong lookout with its stunning view of Melbourne’s skyscrapers. The track continues to Kalorama and another excellent view across Silvan Dam to a patchwork quilt of orchards and crops with Mt. Beenak and the Yarra forests beyond. The track then drops down to Olinda Creek and winds its way along local tracks and streets to the Warburton Trail which brings you to Lilydale, an outer suburb of Melbourne. Although the main street is very suburban, the back blocks of Lilydale are very pleasant and soon you are walking along a disused railway and country roads to Mt Lofty Park. From the broad flat open summit of this small hill you gain an excellent view of the Yarra River as it snakes its way west from the ranges. 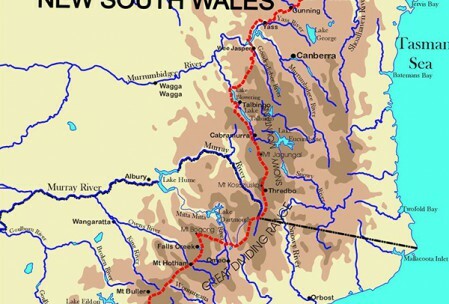 The track then follows 4WD trails and walking tracks along the Yarra through parklands and past historic “Stanebrae” to reach Warrandyte and Pound Bend Tunnel with its fascinating goldmining history. The Track continues along the river and at Mullum Creek near the ruins of “Pontville” it joins the Main Yarra Trail to run past Pettys Orchard and through Westerfolds Park where it crosses the Yarra on a grand footbridge to run through a succession of well-wooded parklands and wetlands. It crosses the Yarra again to run along its south bank to the Swan Street Bridge where it heads north through the sporting heart of Victoria, past the Rod Laver arena and the Melbourne Cricket Ground. From the “G”, the track wanders across Fitzroy Gardens past many of Melbourne’s iconic buildings to the Royal Exhibition Building – site of the first sitting of Australia’s Federal Parliament in May 1901.